Joseph Lyddy was registered as a business in 1893 providing after-sales care of saddle soap and harness dressings. If you are a horse lover, the Joseph Lyddy brand will most likely already be part of your horse, leather and waterproofing care and maintenance. Over a century later and with the continuing change of demands in the pet industry, Joseph Lyddy have moved with market demand expanding their range to include pet care for pooches. This new range of “Pet Indulgence” grooming and chew treats were researched and developed in their own laboratory. The crisp and clean look packaging compliments the unique blend of essential oils and moisturising nutrients along with being PH balanced, paraben free, hypoallergenic and 100% Australian Made! 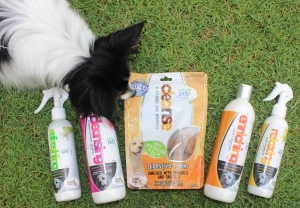 The range includes; Calming 2 in 1 Puppy Conditioning Shampoo, Cleansing Everyday Oatmeal Shampoo, Enriching Crème Conditioner, Relaxing Silky Detangler and Refreshing Deodoriser along with four types of chew treats; Cleanse Digestive, Energise Vitality, Mobility Joint Care and Oral Care Dental. Amber and Indy are feeling pretty special at the moment. They received a range of Joseph Lyddy “Pet Indulgence” to sample! -with Chicken, Duck: Each of the Digestive Chews are about the size of a 20c piece and being soft in texture were was easy to break up into smaller portions for my pint sized pups. They equally enjoyed them and went down a “treat”. – with Lemon, Clary Sage: Anyone who owns a long coated dog, particularly with fine ear feathering knows just how hard it is to detangle knots without tearing them out completely. I am pretty sure Amber wishes she was a Puli dog because she insists on creating perfect dreadlocks with her ear feathering. I sprayed the relaxing detangler directly onto the offending dreadlock, massaged it in and using my fingers was able to pull it apart with very minimal tearing, finishing with a light comb. – with Mint, Lime, Coconut: I do not usually go for deodorisers, simply because many leave a strong and overwhelming scent. Before application, I ruffed up their coats and then sprayed a light mist all over. Once dry both pooches were left with a light and pleasant scent. No tacky overwhelming scent! – with Cedarwood, Geranium, Ylang Ylang, Lavender: A nice light silky texture that was easily dispensed from the bottle and lathered up quickly and evenly over the coat. The scent is woody and calming. – with Sweet Orange, Lemon, Vanilla: A nice creamy texture that was not overly thick to dispense. Again I found it quite easy to spread over the coat and when massaged in felt nice and smooth. The scent is crisp and refreshing. Unfortunately, this post does not come with ‘Scratch N Sniff’. I wish it did, the delicious scent of each product with its own unique blend of essential oils is like breathing in the aromas of a day spa! Their coats are soft and silky and I am very pleased with the light pleasant scent that remained on their skin and coat. I thought the products were really lovely, good quality and suitable for majority of coat types. I thought the chew treats all @$9.95 a bag and the grooming range starting @$12.95 was good value for money and competitively priced with other brands in the market. My pooches thought they were…well…very indulgent indeed. A big “Thank you” goes out to “Joseph Lyddy” for sending us a range of their “Pet Indulgence” products to sample and most of all for proudly supporting a very worthy cause; Guide Dogs Australia. That detangler sounds good, anything to make it easier with grooming our long haired dogs. Ambers coat is very fine, especially her ear feathering and it can tear so easily. So I was happy that I was able to detangle the majority of the offending dreadlock! Next story My Dog Has Meningitis!